" Today we are excited to offer a new way for many more people to access Google PowerMeter: our new Featured Device partner Current Cost - the largest global supplier of real time displays for monitoring energy use. Having already sold one million energy monitoring devices, Current Cost will now offer devices that are compatible with Google PowerMeter. They will also offer upgrades to existing customers so that they too can monitor their energy consumption anywhere online with our software. 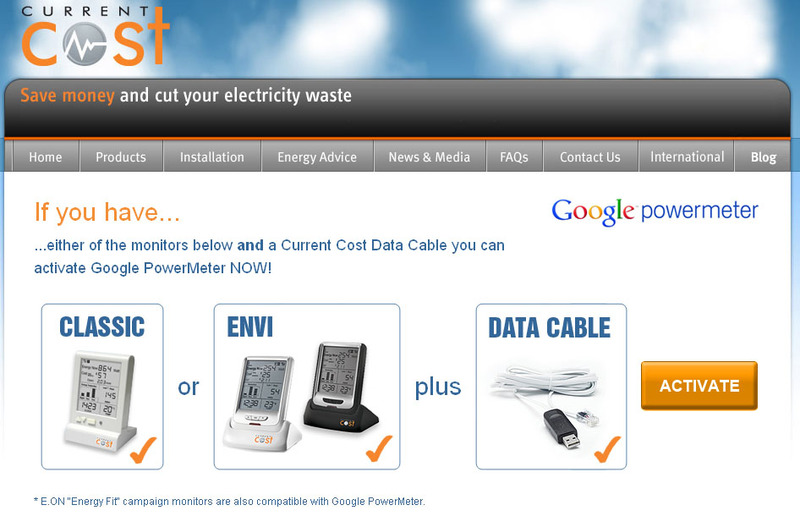 ...either of the monitors below and a Current Cost Data Cable you can activate Google PowerMeter NOW! Google PowerMeter, a free online tool that connects to Current Cost devices, enabling users to receive real-time energy information on their customised Google homepage,.......... "
・Start saving energy and money now with Google PowerMeter.